Eyeliners. To be quite honest the amount out there is a little too overwhelming for me to even think about. Pencils, khol pencils, liquids, felt tips, gels.... the list is endless. I don't use eyeliner everyday, I'm not very talented in the department of application and my eyes are fairly small so it isn't a vital product in my make-up bag but now and again I like a bolder look so eyeliner is a must. As of yet I haven't found a 'holy grail' eyeliner that stands out above the rest of them and has me going back to buy over and over. I own a fair few don't get me wrong but I normally just pick any old one out and add a tiny bit to my lower lash line when needed! I spotted this new product from Maybelline last week and the sound of it immediately had me interest. I've tried gel liners in the past and even though they seemed to have a better staying time they always seemed a bit messy and a bit more effort then others. 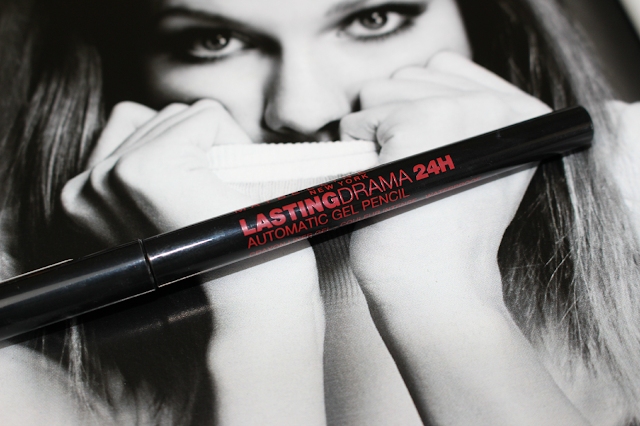 So to see a 'gel' liner in pencil form seemed like the best mix of the two for me. This looks like your usual khol pencil but you have all the goodness and glam of a gel liner without having to have a pot and brush at the ready - hence the 'automatic' in the title! For me this has been a god send, like I said before I don't wear eyeliner everyday but I have actually been using this all week! Half way through my working days if I've used a bit of my usual eyeliner I always notice that the amount I have applied has disappeared but with this hours later it is still there in a great bold line. Amazing staying power. I'm so impressed with this product, the only thing that I was a little confused about was the fact that when I seem to twist the bottom to reveal more product nothing happens. So I'm not sure whether you only get what you see when you buy it or if mine is broken - either way will 100% be repurchasing this when I'm all out and I may even give the pen version a try too. From what I remember this was £4.99 - I can't seem to find it anywhere online yet but I'm sure it will be on the likes of Boots & Superdrug soon enough. This looks really interesting. I am the worst when it comes to applying liquid eyeliner! I have this too and I bought it in Boots. It's great :D nice review! This sounds like a really interesting concept, I'll have to check this out! Hm...never used this pencil...Seems it looks good. Ooh this looks super interesting! I've not heard of this before, but I'll definitely keep an eye out for it.